Gary, you are doing a great service for Nevada and for the nuclear industry. I am pleased to be supporting your cause. I am 93 years old and one of the few people living that worked for General Groves on the first atomic bomb. I do not understand how Senator Reid can hurt the entire US energy industry, and go to sleep at night. Of course any one that knows anything about nuclear would take a position against him because of what he is doing. I am amazed that the President has not taken a position against him. Keep up the good work. I forgot to mention that the same politics are being played by the two senators from Utah in stopping PFS from going ahead. The country badly needs a temporary storage center and PFS is already licensed and ready to go. In retirement, civil and environmental engineering alumnus Ernest (Ernie) Tremmel prides himself on staying fit and active. Every morning, he does 40 push-ups and 20 minutes of exercises. Many days, particularly at his Florida home, he plays doubles tennis for an hour. 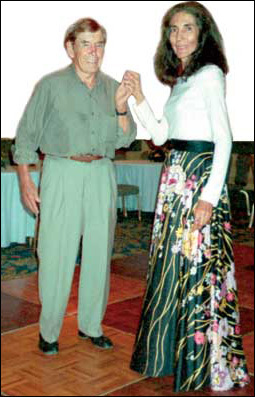 Many evenings, he and his wife, Ellen, a native of El Salvador, find the nearest club and spend hour’s ballroom dancing. “That way, I get enough exercise that when I come back from dancing, I usually have a hot fudge sundae or a milkshake,” he says. Ernest Tremmel, who lives in Washington, D.C., for about eight months each year, also maintains a part-time business, Ernest B. Tremmel Inc., through which he is a nuclear energy consultant for a number of clients. As a result, he is a Capitol Hill regular. “I go along with our companies' lobbyists and explain energy to the senators and congressmen,” he says. He graduated from Aquinas High School in LaCrosse, Wis., and enrolled at UW-Madison. From 1941 to 1973, Trammel’s career traces the history of U.S. nuclear physics. When he graduated from college in 1941, in the midst of The Great Depression, he was so eager to take a job that he skipped commencement ceremonies. He worked for just two months as a draftsman for Curtiss-Wright Corporation, a St. Louis company that built essential war products. Then he joined the Army Corps of Engineers, first helping supervise the construction of the $90 million St. Louis Ordinance Plant. By then, the United States had entered World War II and Tremmel joined the Corps of Engineers Manhattan District. He began working in Wilmington, Delaware, as a control engineer. At the time, the corps' Wilmington office administered contracts with the E.I. duPont de Nemours Company to construct the Clinton Engineering Works (later the X-10 research reactor at Oak Ridge, Tennessee) and to construct and operate a plutonium production plant in Hanford, Washington. Tremmel directly assisted the area engineer in establishing and organizing the Wilmington office and administering its contracts. He also was responsible for the Wilmington offices and outside contractors' role in the controlled materials plan and the Manhattan priority program. In 1945, he was temporarily assigned to the office of Gen. Leslie Groves, who directed the Army Corps of Engineers Manhattan Project (the country's endeavor to build an atomic weapon before Germany or Japan did). “And then I was given a telephone number to head out to Los Angeles — assigned there, and all they gave me was a telephone number and didn't tell me the name or where I would be working,” says Tremmel. When Tremmel arrived, he found the Calexico Engineering Works. Tremmel's role was to help negotiate and expedite procurement of parts for the atomic bomb, which was being developed at a secret facility in Los Alamos, New Mexico. “The purpose was to ship all of the parts to Los Angeles, then at night, Navajo Freight Lines would take the parts to Los Alamos to assemble the first atomic bomb,” he says. Eventually, Tremmel moved to the Atomic Energy Commission (AEC) to pursue peaceful applications of nuclear energy. He worked first in the AEC Chicago office, where he helped Argonne National Lab and other contractors obtain a variety of reactor-related materials and supervised government contracts for research and development in research, biology, medicine and reactor development. He became deputy manager of the AEC Cincinnati office before establishing and becoming manager of its Hartford, Ct., office. That office held a contract with Pratt and Whitney Aircraft to develop a nuclear-propelled aircraft. Tremmel also oversaw the administrative and technical aspects of the $50 million Connecticut Aircraft Nuclear Engine Laboratory, a facility the Corps of Engineers was constructing for the U.S. Air Force. 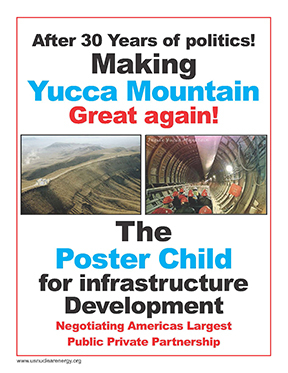 Following a few years as special assistant to the AEC commissioner in Washington, he spent the last 12 years of his career as director of the AEC Office of Industrial Participation, which bolstered the commission's participation with U.S. industrial organizations and helped to strengthen competition in private enterprise in the atomic energy field. Tremmel's experiences provided a perfect background for the consulting company he formed in 1972. Today, he says, as nuclear power becomes an increasingly popular energy alternative, business is booming and his work keeps his mind sharp. The exercise keeps his body strong, too — although recently, he's had a few physical setbacks: a pacemaker to regulate his heartbeat, two partial knee replacements, and one new hip. The pacemaker surgery left his muscles a little sore, so he dropped the number of push-ups he does daily from 60 to 40. And his comeback from hip surgery, which a Florida doctor did using minimally invasive techniques, took just a month. “So every time I come back from dancing, I say a hail Mary that I'm so mobile — I can do the swing and most anything I want,” says Tremmel, who includes the fox trot, the rumba, the samba, the waltz and the polka among his dancing repertoire.